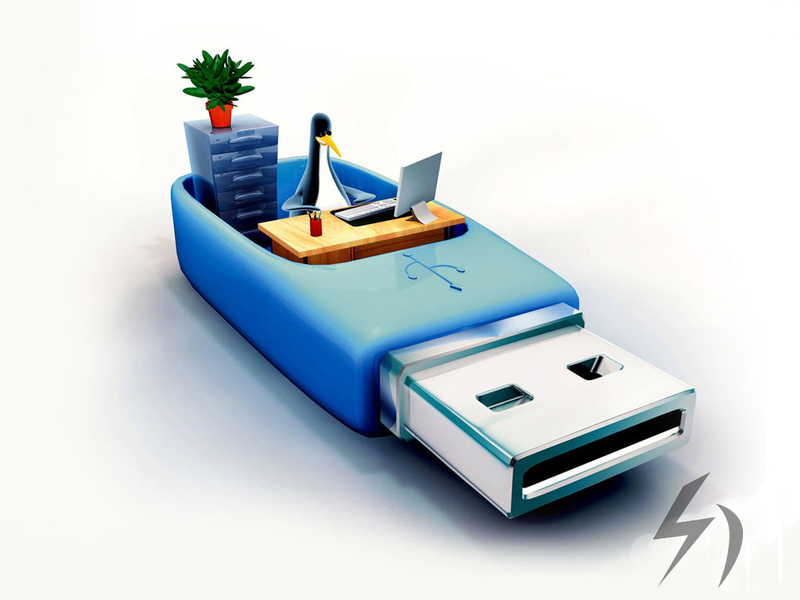 USB Pen drive is extensively used by us to store and migrate data. We daily use it as a secondary storage device. But have you ever thought of using it as a RAM…. Confused?? Not many know but Yeah!! You can use your USB Pen drive as RAM to boost up Performance of your Windows PC. Though, it wouldn’t be your primary Random Access Memory (RAM), instead it will perform like a virtual memory processor. It would not only boost up your computer’s performance but also enhance your experience of playing games. Hence, it becomes useful for those who does not have a highly configured system. You just need to make sure that you have at least a USB pen drive of 1 GB or else this trick won’t work. 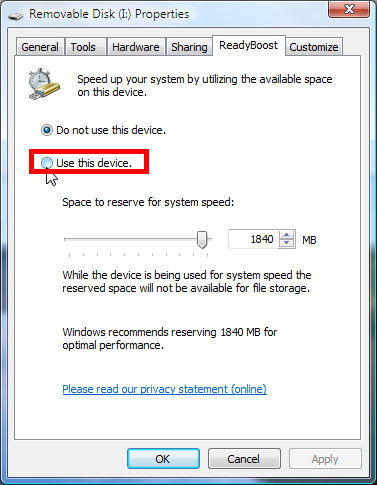 The step-by-step guide of How to use USB Pen drive as RAM to boost performance in Windows is given below. Step 1: Connect your USB to your PC. Note: Make sure that you have at least USB Pen drive of 1 GB. 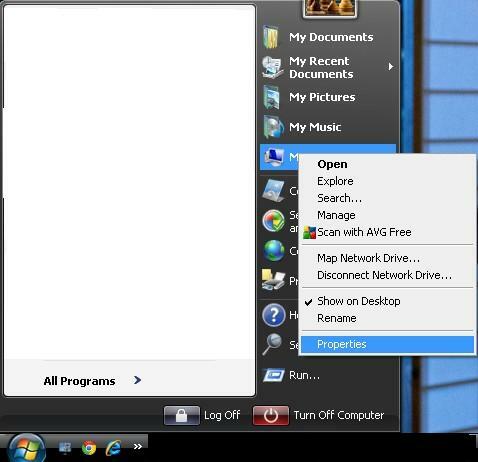 Step 2: Now, go to START button, right click on MY COMPUTER and select PROPERTIES. You can also right click on MY COMPUTER icon at your desktop. Step 3: Click on ADVANCED tab. Select “settings” Option under the “Performance” option. Step 4: A new Window of Performance Option will prompt on your screen Click on Advanced Tab. 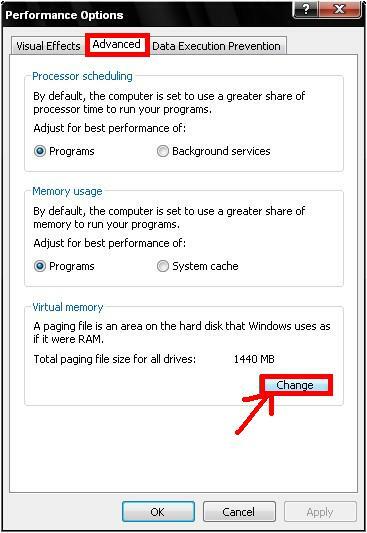 Then, click on CHANGE option under Virtual Memory bar as shown in the below image. Step 5: Search for your USB Pen drive, select it and choose “Custom size“. 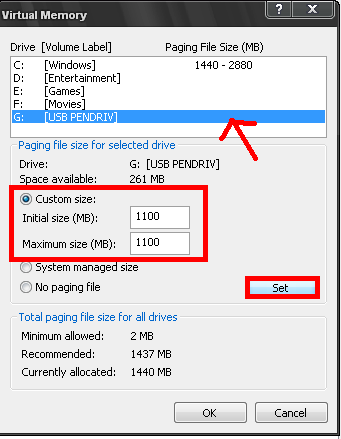 Fill the initial and maximum size as per the available space free on your Pen drive as shown in the below image. NOTE: For Windows 7 and 8, uncheck the box “Automatically Manage Paging files size for all drives” before doing this step. Step 6: Click on SET and press ENTER. Step 7: Restart your PC with the Pen drive inserted to your PC. You are done now, your system performance has been increased. Also Read: How to hide hard drive or partition in Windows 7/8/XP/Vista-Full procedure. If the above trick seems to be difficult and long to you then you can use the alternate method – Ready Boost. Ready Boost is a feature in Windows Vista and 7 that allows you to use your USB Pen drive, Memory card as a RAM in your PC. It transforms your secondary memory device into cache memory device. Step 1: Open MY COMPUTER and select your USB Pen drive. Step 2: Now, right click on your USB Pen drive and select PROPERTIES. Step 3: Go to the tab “Ready Boost“. Check the box ‘Use this device‘. Move the slider to allocate the memory that you want to be used as RAM as shown in the below image. Step 4: Click on APPLY and then SELECT. You are done. That’s all you need to do. Your system performance has been increased. You won’t be able to store data in your USB Pen drive till you are using it as RAM. 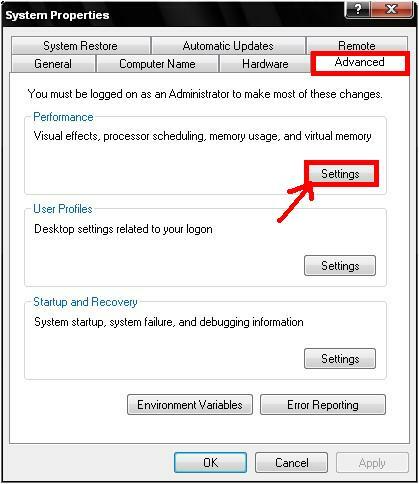 There can be chances that the settings would not match as exact given in the steps because you may be using another OS. So, opt for the best probable settings. DISCLAIMER: This article is for education purpose only. Do it at your own RISK. For more information about disclaimer, click on this link.